I know it's not the most exciting picture in the world, but this picture means alot to me. For the last 2 weeks my husband has been propping this crutch underneath his arm to hold hold him up because he hurt his back. It broke my heart to see my big, tough husband in so much pain he couldn't even walk. I think what broke him even more then the pain was not being able to do anything. My husband is a servant. He serves and gives with his whole heart just to bless people. He truly is the hardest worker I know and taking that away from him was like taking a part of him away. He wasn't himself and I missed him. During this time I became grateful that this soon shall pass. He will be restored fully and back to his old self. Some women can't say the same, they are taking care of disabled husbands, parents or children. It's the everyday things we take for granted like using our body and doing mennial tasks on our own. 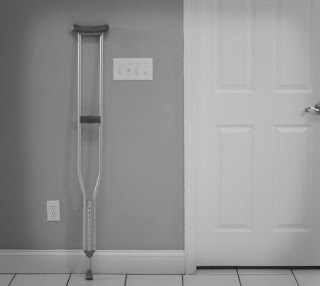 So today I'm grateful for a healthy husband, because today the crutch is propped on the wall and not under his arm. I love your new blog!!! I'm so glad Phil is feeling better and able to help with Chase and Zaya! !